FREE GIFTS WITH ORDERS exclusive to some items. 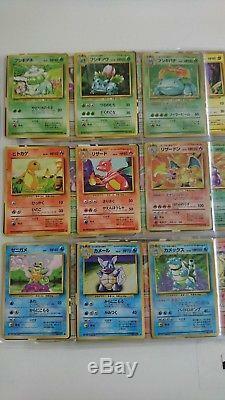 POKEMON JAPANESE BASE SET COMPELTE 102/102 MINT-EX HOLOS, RARES, UC, C CARDS 1996. WHAT IS PHOTOGRAPHED - IS EXACTLY WHAT YOU RECEIVE. This is for the complete originally base set from 1996 in the japanese language. IT INCLUDES ALL RARES, HOLOGRAMS, UNCOMMONS AND COMMONS. We can include free binder pages if you would like, and special bonus gift with all orders. Condition is very good given these are from 1996 and over 22 years old now, we aim to try and bring you the best quality we can. We allow time for payments to be made, and combine all orders. As we list monthly PSA 10 auctions all the time. CONDITION - MINT - EXCELLENT OVERALL. Please read below for full breakdown of my condition format. IF THIS IS A GIFT FOR SOMEBODY, PLEASE NOTIFY ME, SO I CAN DECLARE IT AS SO. WE NEED TO CALCULATE DEPENDING ON WHERE YOU LIVE. Please read below for full breakdown of my mailing details. MY CONDITION WORKS SIMILARLY ALONGSIDE VGA / PSA STANDARDS - I TRY TO DEMONSTRATE A RANGE FOR ALL LISTINGS, AS COLLECTORS SEE THINGS DIFFERENTLY FROM ONE ANOTHER, WE DO OUR BEST TO DESCRIBE ITEMS ACCURATELY, AND PROVIDE INDIVIDUAL PHOTOGRAPHS FOR ALL LISTINGS, SO PLEASE GO OFF THE 1080P PHOTOGRAPHS TAKEN. A gem mint card is a flawlessly pristine packet pulled, no wear at all, in my opinion the best a card or game can possible be. A mint condition card is an amazing almost pack fresh pulled card, but may be off center slightly, have 1-6 mm's of faint white edge wear, around corners or the sides of a card. It may also contain hairline scratches which are usually machine induced from wizards of the coast or Nintendo themselves. A mint card is always border-lying gem mint-mint, and can swing either way when being grading. Near MINT 8.4-6.5/10. A near mint card or game is still an immensely exceptional item. It is almost perfect, but must contain a minor flaw which is stopping it from being a high gem mint piece. Near mint cards usually may have one of the following: between 1-12mm's of back edge wear, feathered surface scratches, light playbility, may contain minor light saturation, inking, minor bends, or tears. Still an awesome condition card, these will look flawless in a binder sleeved, and you will not be able to see the flaws from afar. These cards will have 2 or more of the following flaws: between 1-32mm's of back edge wear, surface scratches, light playbility, may contain minor light saturation, inking, minor bends, tears, marks, scuffs. As the word suggested, this is heavily played in a school yard, or treated badly by children. It would contain immense edge wear, massive bends, massive tears, massive flaws like light saturation, inking, spills, stains, marks, scuffs. The list goes on, if it has 3-4 of the major flaws i mention above it usually falls into played condition. Estimated time of arrival depends on the location, generally 2-3 weeks for international buyers. What is the average turn around time for deliveries? You have the option for EMS express which is 2-6 days on average. E IF YOU CHANGE YOUR MIND, OR FIND THE ITEM CHEAPER ELSEWHERE, YOU WILL NOT BE COVERED. Please refer to the individual photographs of all listings, and the condition description range. Will my item be wrapped well? Everything is greatly wrapped in multiple layers of bubble wrap, cards with secure toploaders, new sleeves, cardboard when necessary, and we use cotton based synthetic gloves for high end items. The item "POKEMON JAPANESE BASE SET COMPLETE 102/102 MINT-EX HOLOS, RARES, UC, C CARDS 1996" is in sale since Tuesday, July 31, 2018. This item is in the category "Toys & Hobbies\Collectible Card Games\Pokémon Trading Card Game\Pokémon Individual Cards". The seller is "japan-international-trade" and is located in Omiya. This item can be shipped worldwide.